We all have stories to tell. Some of us are lucky enough to be able to express them in writing. And some of us are lucky enough to have blogs to tell our stories. But there are often stories and experiences that we need to share, that are so difficult to do. These are intensely personal. We’re afraid to share them on our blogs or put our names to them, for fear of being found out. We fear that writing these stories might offend or embarrass our friends friends and family who read our blogs or who are a part of these experiences. Yes, it’s important to be authentic, but it’s also important not to throw people under the bus when we tell all. If you’ve read some of my posts, you’ll know that I tend to couch my words so as not to name people. Sometimes I’ll even change the gender of someone I’m sharing about so no one can guess who I’m alluding to. But it’s hard to hold back in this way. I’ve been thinking of this for a while now. And here’s what I’ve come up with. Anonymously Me will be regular column in which you are invited to share your personal stories anonymously here. We know how venting and realizing that others have similar experiences helps . Comments will be open on these posts for about 15 days and the writer can respond to them via an anonymous ID that I will set up. Please be assured of me keeping your information (if you use your email address) confidential. Only the content you send for posting will appear here. So send me your stories, using an anonymous email address if you like, via the contact form. The stories should be 500 words or more. I reserve the right to edit language and grammar. Any other edits will be made in consultation with you. Should you have any questions, please ask them in a comment here or using the contact form. 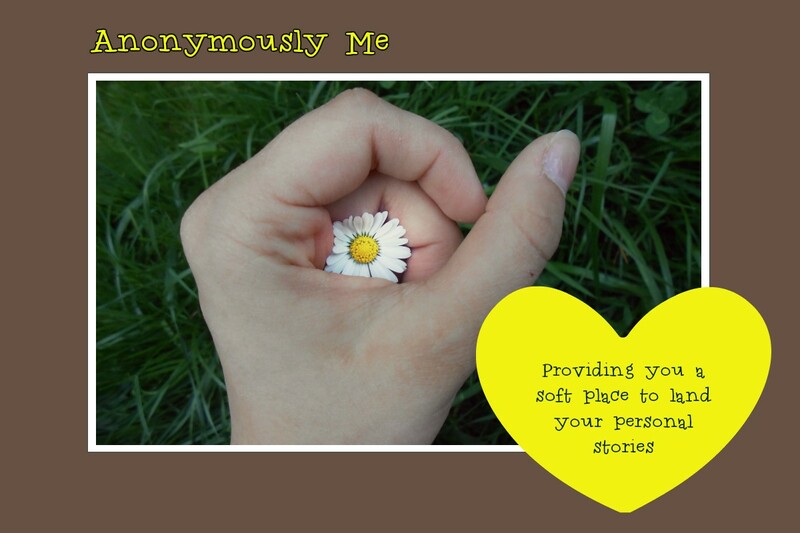 Anonymously Me will be a safe place to land your personal stories. I’m grateful to my blogger friends who encouraged me to go ahead with this idea. Thank you! I am glad I found it. I am looking forward to contribute. Your smile is contagious Corinne. Let me know when you’re ready to contribute, Upasna. I’ll be waiting. Thanks for the compliment too! I hope you’re smiling. Sure Corinne. Yes, your smile is rubbing off on me. Dear Corinne – this is a simply super idea. What a pity it wasn’t around when I was going through %^&**((*(#### a few years ago. Of course I did vent but being the techie ignoramus I didn’t know how to not allow access to the people who I was referring to and even though I changed the names, gender etc, they cottoned on to the narrative and as you know then ……all hell broke loose. I think this will be a huge hit! There are so many things that we would like to say but don’t. It seems that you and I have unwittingly used the same tag line! Great minds think alike. I have started a new Facebook Group and that is the tagline there “A soft place to land when you need it the most! I can’t read more of this series! This is a great idea for people who want to unburden themselves without fear of reprisals. I wish you much success with it, Corinne! Oh, I love that idea of the safe place. As for me I write a lot off line also, and sometimes very personal stuff- but it feels good to “get it out”. Im sure many of us are like that. Great initiative dear Corinne!! Best of luck, Corinne. Many years ago I tried to form a support group for a certain disability I was involved in. It was an interesting experience and what I learned is that there is such a need out there for what you are trying to do. I hope the pain you uncover does not discourage you. There may also be stories of pain and healing. Best of luck. Interesting…hope this works out well! Looking forward to seeing more. Good idea to offer a save place to speak honestly about our pain. Great idea. I agree that we don’t need to cause pain to others in our sharing and some things are hard to write about! Glad you think so, Liv. I love this Corinne. It would actually be like going to a therapist anonymously! There are so many bloggers avoiding subjects that are taboo or inappropriate to reveal. Great concept! Great initiative Corinne All the best. That’s a great initiative and I am sure there will be many stories that will be shared through you Corinne. Thanks, Parul. I do hope so. “a soft place to land your personal stories” is wonderful. I hope you get loads of interest. Great work, lovely. Thanks for being a sounding board, Katie! I think this is a phenomenal idea Corinne and I, for one, will most definitely be utilizing this feature.. Often.. Thank you for this. Thanks, Karen. I needed your vote of confidence! I coincidentally clicked your link at #BlogShareLearn linky. I am so glad I did. I shared this on Twitter. It is wonderful what you’re doing to give people a forum to anonymously express themselves. Thanks so much, Janice. Appreciate the share too! This is a great idea, Corrine. I think you’ll have success with it and what a great way to help people. I haven’t been by for a while…:( I often see your smiling face at My Inner Chick and other places I also love to visit. Thanks, Lisa. Haven’t visited your blog too for a while. Glad you stopped by. You’re very welcome, Freya. Thanks for stopping by! Glad you think so, Nan.